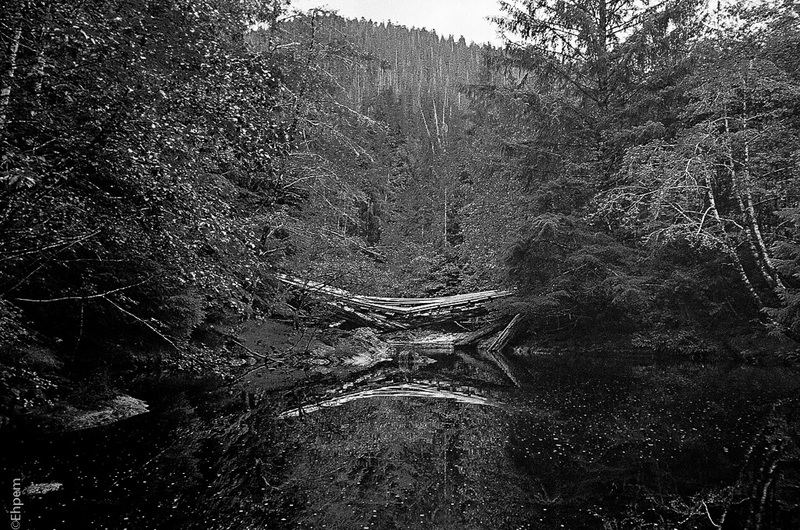 This collapsed logging road bridge is another of them. Thank you Rachel. I find these decaying industrial sites to be very gloomy. But what I liked about this scene was how the broken bridge was like an upside down intact bridge in a Japanese garden or similar. The curve has a very pleasing arc that somehow fits into the scene. I had to wade across the stream to get around the bay as the stream ends in a waterfall into a deep pool on the beach and that crossing would require swimming. It was a bit of a bush-wack to get far enough upstream to find water shallow enough to cross in tall rubber boots (just barely shallow enough though). So, I had to work for this shot, or rather I had to work, and this view was my unexpected reward.